Art is a HUGE orange juice fan. He drinks it every morning with breakfast. Personally, after so many years of the same thing, I got a little burned out on reconstituted orange juice. So a couple of years ago we switched to the bottles. But everything we tried said “made from concentrate” on the label. Also, I worry about the pesticides and other chemicals that could be present in my orange juice. I mean, if I buy an orange, I can peel it and wash it, but what protection do I have if it’s already juiced? Uncle Matt’s Organic to the rescue!! They were kind enough to send me a coupon to sample their organic juice. We picked the Pure Organic Orange Juice with Vitamin D and Calcium. Uncle Matt’s Organic was started in 1999 by Matt McLean (he really is an uncle to 10 nieces and nephews!!) The company was born out of a passion for healthy living and a desire to continue his family’s citrus growing legacy. The family is on its fourth generation of farmers!! They started their organic orchard with 3 acres in Matt’s dad backyard. Today Uncle Matt’s manages over 1100 acres of organic citrus and works with 25 small family farmers whom the company helped convert to organic. Art and I decided to taste test the Uncle Matt’s (on the left) against our store brand “made from concentrate” (on the right). Can you see the color difference? 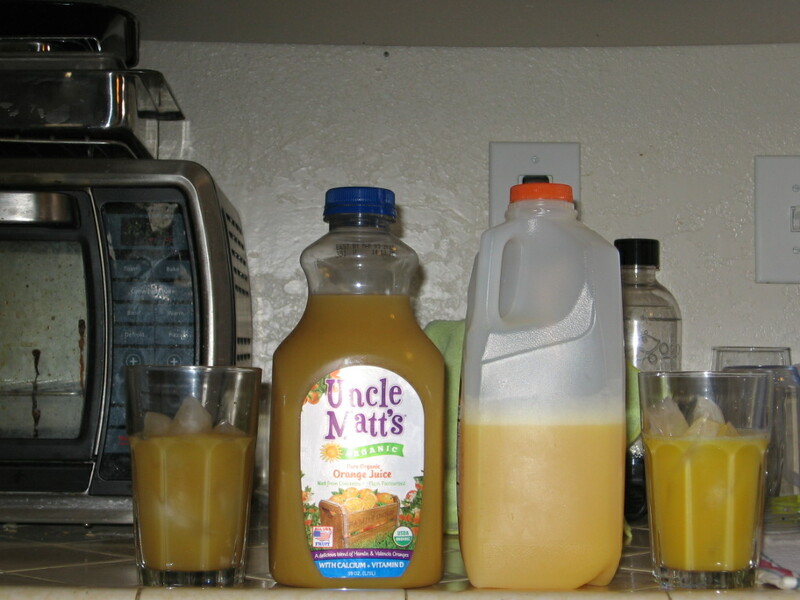 That is because Uncle Matt’s is soft-squeezed from fresh Valencia oranges, We both agreed it tasted just like drinking a glass of fresh-squeezed juice. And all Uncle Matt’s oranges are grown using USDA certified organic methods. They believe that building a healthy soil builds a healthy tree and great tasting fruit. Our taste buds certainly agree – and it’s better for the environment!! I give Uncle Matt’s Organic Juice a gigantic thumbs up!! They have brought me back to morning orange juice!! Disclosure: I received the above products through Sublime Media Connection in exchange for an honest review. In no way was I asked to give a positive review. I have to admit I am drawn in by the difference of color too. Sounds super yummy! I’m going to have to look for this. In our home we always try to have fresh oranges to eat as snacks instead of buying orange juice. I’m glad you mentioned that Uncle Matt’s grow their oranges organically. This would certainly be a good reason to give them a try. Thank you for sharing your review.